Does Mayor Bloomberg have an East Village trip penciled into his schedule? 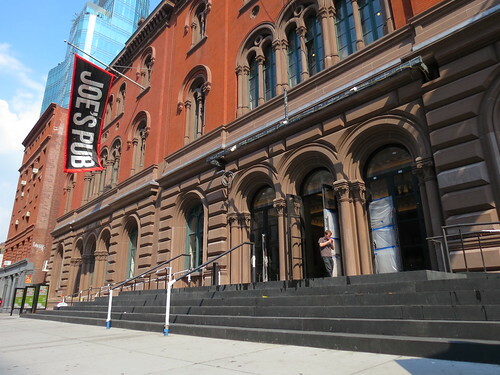 A spokesperson for Joe’s Pub let slip that the mayor would be attending a ribbon-cutting at the Public Theater on Oct. 4. In a subsequent e-mail she said she couldn’t confirm Mr. Bloomberg’s attendance (mayoral plans are fickle, after all), but it’s clear the re-dedication ceremonies are going to have some star power. The theater broke ground on what was expected to be a $40 million renovation project in March. Earlier this month, ArtsBeat reported that the Bernard and Anne Spitzer Charitable Trust, founded by the parents of Eliot Spitzer, gave $4 million to the theater. It’s uncertain whether Andrew Carmellini’s hotly anticipated mezzanine lounge, The Library, will be in full swing for the celebrations, which come exactly a year after an upgraded Joe’s Pub reopened; the chef didn’t respond to an e-mail inquiry. This week, Eater reported The Library would open in the second week of October. 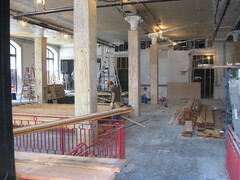 Just one block south on Lafayette Street, work continues on Mr. Carmellini’s somewhat mysterious French restaurant in the former Chinatown Brassiere space, as you can see in a photo we snapped earlier this week.